First – and undoubtedly foremost – is the economy and the euro. This was an issue on which dominated Van Rompuy’s time as Europe’s leaders battled the financial crisis. Quarterly summits became monthly summits. Tiny step by tiny step (with the occasional longer stride), the European Union advanced to keep the demons at bay. Tusk now takes up the fight. He has impressive credentials, with Poland, unlike other EU countries, avoiding recession during the height of the crisis (although the economic situation soured towards the end of his time as prime minister). But this is a challenge of a new order. The new President will have to be – like his predecessor – a facilitator. There are many divergent views on the euro, and the economy in general, around the European Council table. But Tusk’s relatively non-ideological approach to politics will help: under his leadership, his national party, Civic Platform, successfully spanned liberal, centre-right and conservative strains of thought to govern Poland. He can build consensus. Crucially, he has the support of Angela Merkel, Germany’s chancellor, and is acceptable to David Cameron, the British PM. a more solid and resilient factor of stability and growth: with stronger euro area governance and stronger economic policy coordination, convergence and solidarity, while respecting the integrity of the internal market and preserving transparency and openness towards non-euro EU countries. Tusk – as leader of a non-eurozone country – was in the vanguard of a set of leaders who backed closer eurozone integration (as ‘good’ and ‘responsible’ Europeans) but worked to avoid a two-tier Europe. (And Tusk will now chair eurozone summits, even though his country remains outside the single currency area). Cameron’s approach is more abrasive, but Tusk will have at least have a good understanding of the concerns of the ‘outs’. On general economic policy, the European Council’s wishes are already being enacted to some extent by the new President of the European Commission, Jean-Claude Juncker: a focus on completion of the digital single market, on entrepreneurship and job creation, on investment, on building an Energy Union, and on international trade. Endorsement of Juncker’s Investment Plan, presented to the European Parliament on Wednesday, will be one of the main topics of discussion when Tusk takes the chair of the European Council for the first time on 18-19 December. A first test for the Pole will be how he balances the wishes of those – including Juncker – who want member states to contribute to and strengthen the new European Fund for Strategic Investments (EFSI), and EU budget hawks. Several commentators have said the Fund is too small, and Tusk will be a major player in any bid to enlarge the public sector contribution to the EFSI. Tusk’s second major challenge is foreign policy – a topic that has increasingly featured on the European Council agenda. 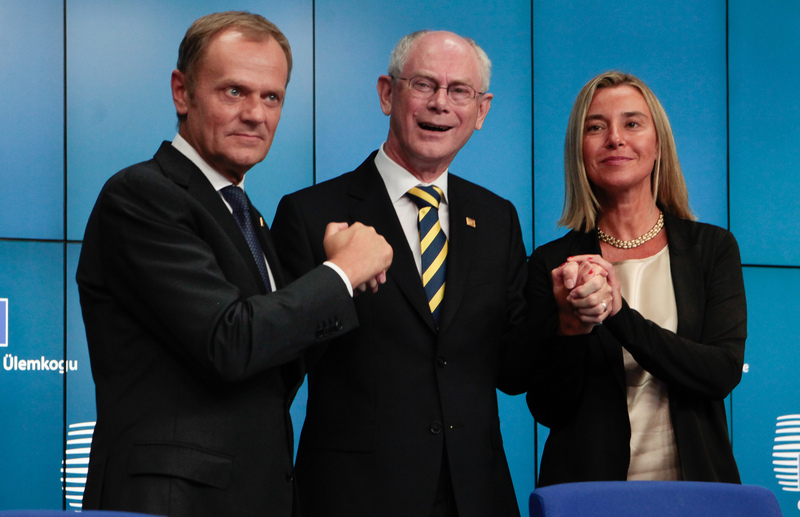 The deal that handed Tusk his new role – with unanimous backing – also saw Federica Mogherini (pictured right, with Tusk and Van Rompuy) nominated as the EU’s new High Representative for Foreign Affairs and Security Policy. Mogherini’s perceived weakness towards Russia meant that leaders of several central and Eastern European governments were reluctant to back the Italian (Lithuania’s President, Dalia Grybauskaitė, even abstained in the vote). They, in particular, will look to Tusk to be a counterweight on the crisis in Ukraine and Europe’s overall approach to the Russian President, Vladimir Putin. Tusk knows that relations with Russia will be the key foreign policy issue of his term in office. A ceasefire exists in Ukraine, but is honoured in the breach more than the observance. The new European Council President was quoted in German weekly magazine Der Spiegel as saying that dealing with Russia “is all the more important because we are dealing with a new wave of invasions in Ukraine, with an open war”. He was said to be pleased with the outcome of the G20 summit in Brisbane, Australia, earlier this month, as it highlighted to Putin international disapproval of Russian activity in Ukraine. Energy policy will be another important area of foreign policy. Tusk is said to back a ‘Nato-like’ approach to an energy union, with the EU (and other states) forming a gas procurement union and provide mutual assistance. Any decision by Putin to turn off the tap would then, he believes, have a less severe impact on the countries targeted by Russia, and weaken Moscow’s hand. Immigration will be another area where Tusk will have to reconcile different views. EU leaders committed in June to a strong asylum policy and better management of Europe’s external borders, but diverged over whether the Italian Mare Nostrum mission to rescue asylum-seekers in the Mediterranean should become a European mission. Instead, Triton – a mission launched by Frontex, the EU’s border agency – has a much smaller scope and will not actively seek out migrants in difficulty. Tensions on this issue are likely to continue, not least with leaders in several European countries facing domestic pressure, often whipped up by populists, over immigration. Managing a common approach to the self-proclaimed ‘Islamic State‘ – also known as Isis – will be a key challenge for Tusk, with many leaders looking at how they can work jointly to prevent their citizens leaving to fight in Syria and Iraq (and returning). Tusk is also likely to back the proposed EU trade deal with the United States (the Transatlantic Trade and Investment Partnership, or TTIP), but will have to marshal some sceptical views in the European Council, reflecting the concerns of some sections of public opinion. No reasonable person can imagine the EU without the UK. I cannot imagine it myself. I have talked about it with David Cameron. He put forward many proposals for reforms and I am sure with a reasonable framework of politicians we can reach an agreement. We can strive to eliminate various barriers – freedom of movement of workers, for example. Should Cameron (pictured left) win a second term as British Prime Minister after May’s general election, the prospect of renegotiation of the treaties is likely to become very real. 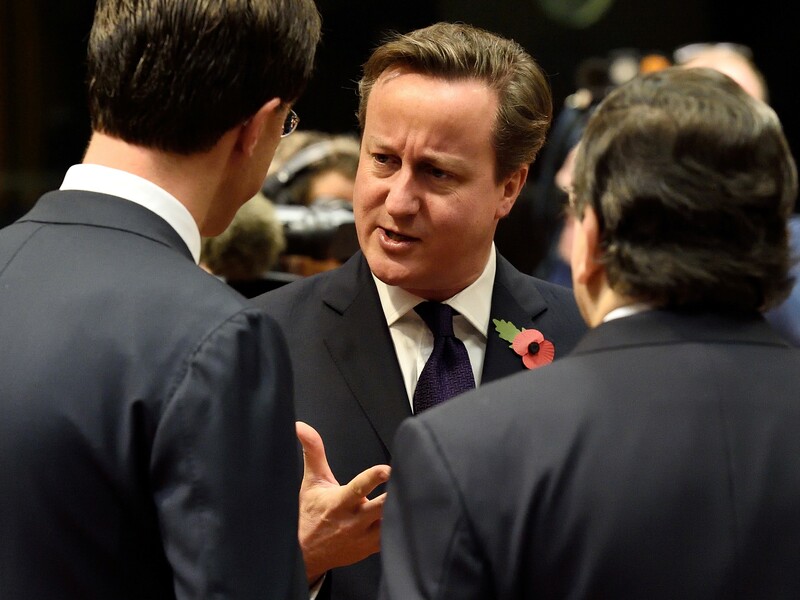 Tusk will want to help Cameron, but not at all costs. He is likely to hold the line Angela Merkel is reported to have taken with London: address ‘benefit tourism’ and perceived abuses, but the principle of freedom of movement remains. The British PM’s speech on immigration today will be pored over in view of a possible renegotiation. Cameron will have to help himself, by facing down the avaricious demands of some of the more radical Eurosceptics in his Conservative Party, as well as those of the UK Independence Party (Ukip). If Ukip – which now has two Members of Parliament, both of whom defected from the Conservatives and won re-election – wins more seats in May’s election, and even has a say in the balance of power in the next British government, Tusk’s task will become even trickier. Under these circumstances David Cameron, if he is still Prime Minister, would probably have to secure treaty change, with nothing else satisfying the sceptics. The President would have a new two-year project on his hands – one that could make or break the Union. Tusk’s in-tray is daunting. This is true not least because – as Hugo Dixon of Reuters pointed out in September – all three of the issues are inter-linked. Tusk has the credentials, the temperament and the political skills to succeed. But the scale of the challenges mean he could, like any leader, also do with a good helping of luck. 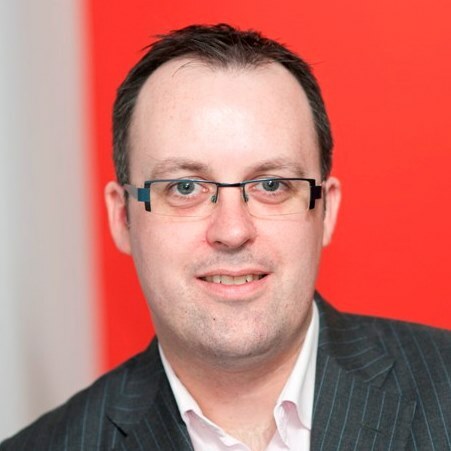 David O'Leary is a Director in the Government Relations team at Burson-Marsteller Brussels and Project leader of Europe Decides.